Editor’s Note: I would like to thank Bill Bradlee, the great grandson of Samuel J. Bradlee, for granting me written permission to publish his ancestor’s letters and other documents. With the exception of one, these letters are owned by Bill Bradlee and may not be reproduced without his written permission. All rights reserved. Mr. Bradlee also passed along materials from Samuel’s pension file which offer fascinating insights into the Siege of Petersburg. These are included here as well. 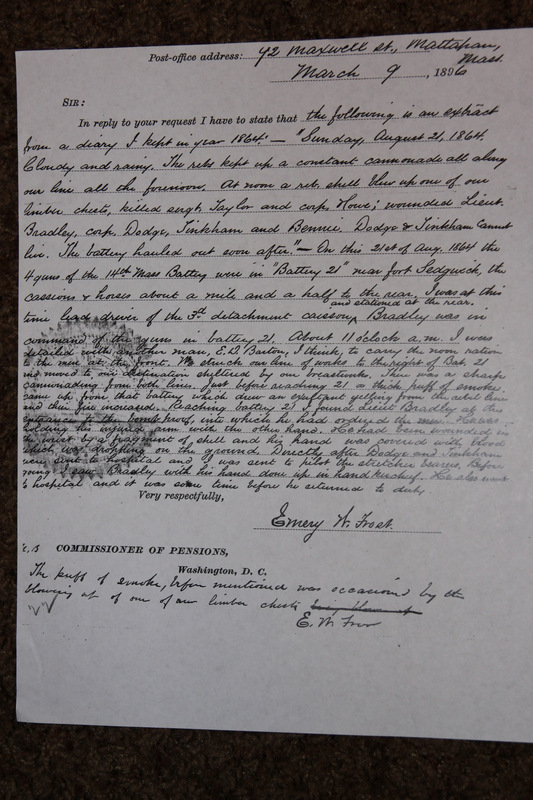 …14th Battery Light Artillery of Massachusetts Volunteers, do certify on oath that Samuel J. Bradley [sic, Bradlee] was a 1st Lieutenant in said Battery, and is, as I am informed, an applicant for invalid pension; that in December, 1864 he went to the hospital and never returned to the Battery. Don’t know the date of his discharge or resignation or reason for [rest cut off]. 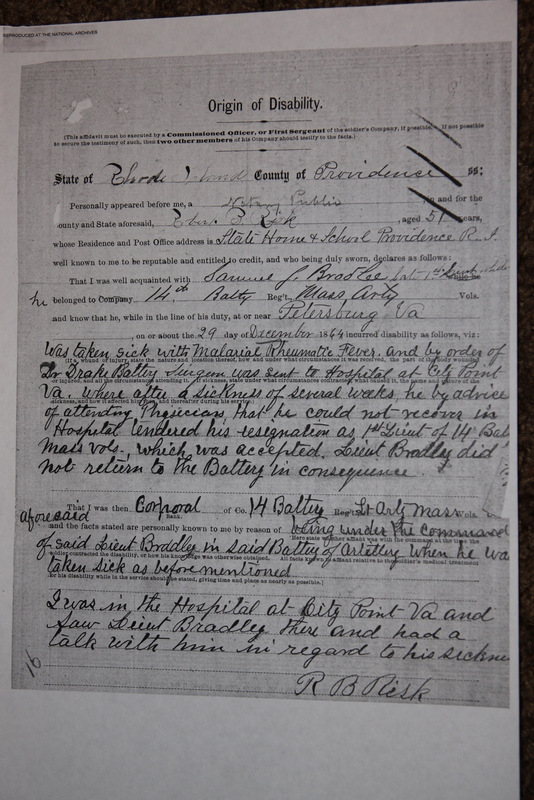 I further certify that the said Samuel J. Bradley [sic, Bradlee] in the service and line of his duty on the 21st day of August, 1864 was wounded under the following circumstances. The guns of the 14th Mass. Battery on the day above named were in position in a small earthwork in front line of the Union works before Petersburg, Va., that was known to us by the name of Little Fort Hell. Lieut. Bradley [sic, Bradlee] was in command of the Battery; I was attached to No. 3 Gun. On this day there had been steady cannonading and picket firing all the forenoon. We had been firing at intervals all the forenoon when just before noon a Rebel shell burst in the midst of the Battery, blowing up a limber chest and killing and wounding a number of the men. Lt. Bradley [sic, Bradlee] was one of those wounded, his injury being in the wrist and caused by a fragment of shell. Shortly after the disaster Bradley [sic, Bradlee] was relieved by Capt Wright and went to hospital. 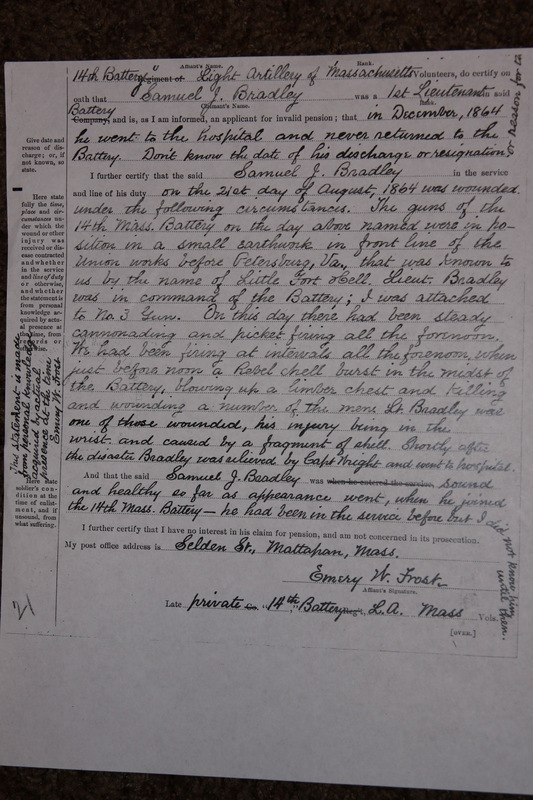 And that the said Samuel J. Bradley [sic, Bradlee] was sound and healthy as far as appearance went, when he joined the 14th Mass. Battery—he had been in the service before but I did not know him until then. I further certify that I have no interest in his claim for pension, and am not concerned in its prosecution. My post office address is Selden St., Mattapan, Mass. Late Private 14th Battery L[ight]. A[rtillery]. Mass. Vols. This statement is made from personal knowledge acquired by actual presence at the time. Post-office address: 42 Maxwell St., Mattapan, Mass. PS The puff of smoke before mentioned was occasioned by the blowing up of our limber chest. Was taken sick with Malarial Rheumatic Fever, and by order of Dr. Drake[,] Battery Surgeon was sent to Hospital at City Point Va. where after a sickness of several weeks, he by advice of attending physicians that he could not recover in Hospital tendered his resignation as 1st Lieut. of 14 Batty Mass Vols., which was accepted. Lieut. Bradley [sic, Bradlee] did not return to the Battery in consequence. That I was then Corporal of 14 Battery Lt Arty Mass Vols. The aforesaid and the facts stated are personally known to me by reason of being under the command of said Lieut. 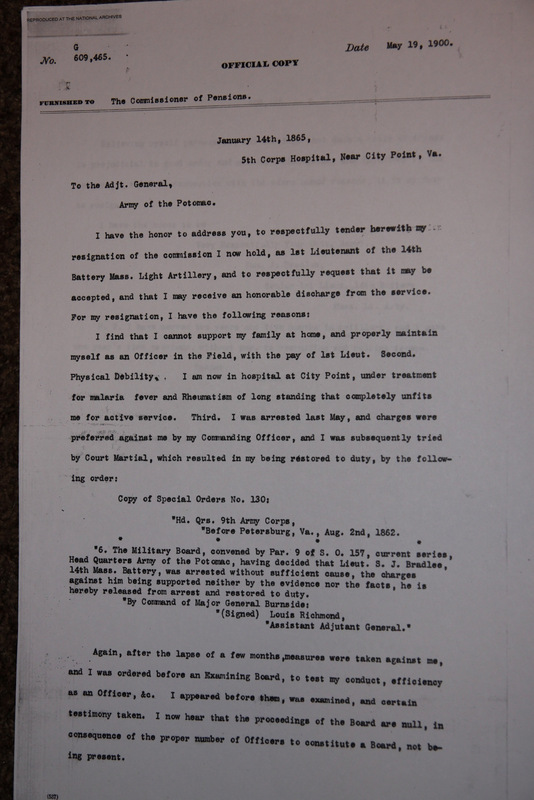 Bradley [sic, Bradlee] in said Battery of Artillery when he was taken sick as before mentioned. I was in the Hospital at City Point Va and saw Lieut. Bradley [sic, Bradlee] there and had a talk with him in regard to his sickness. Furnished to The Commissioner of Pensions. 5th Corps Hospital, Near City Point, Va.
“Before Petersburg, Va., Aug. 2nd, 1862 [sic, 1864]. “6. The Military Board, convened by Par. 9 of S. O. 157, current series, Head Quarters Army of the Potomac, having decided that Lieut. S. J. Bradlee, 14th Mass. Battery, was arrested without sufficient cause, the charges against him being supported neither by the evidence nor the facts, he is hereby released from arrest and restored to duty. Again, after the lapse of a few months, measures were taken against me, and I was ordered before an Examining Board, to test my conduct, efficiency as an Officer, &c. I appeared before them, was examined, and certain testimony taken. I now hear that the proceedings of the Board are null, in consequence of the proper number of Officers to constitute a Board, not being present. Believing myself persecuted, and feelings that such a state of things is prejudicial to good order and military discipline, and injurious to the service, I think in connection with the afore named reasons, it is my duty to resign. 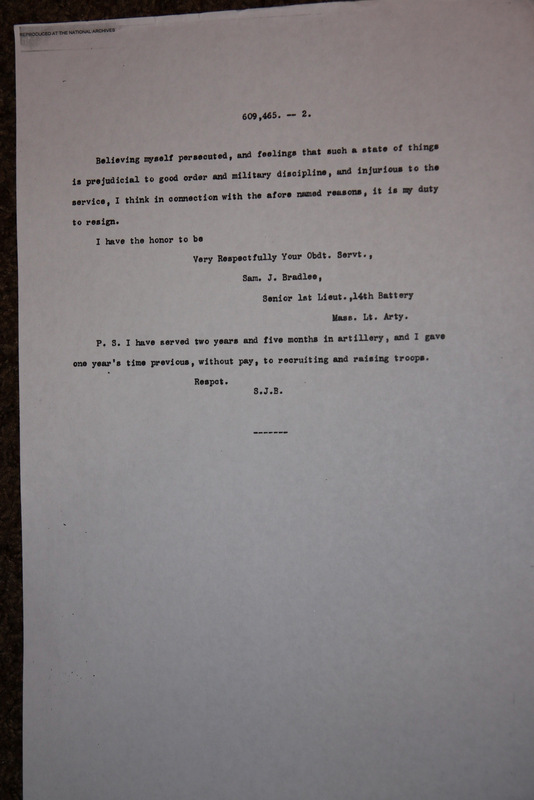 P. S. I have served two years and five months in artillery, and I gave one year’s time previous, without pay, to recruiting and raising troops.